Join us as Mike Gold shows us how the spirit of calligraphy is alive and flourishing in many ways and with many artists. This image rich presentations will leave you wanting to see it all again. That calligraphic impulse is alive today not only in traditional calligraphy circles, but also in the work of artists doing work not always thought of as calligraphy: graffiti artists, painters of all kinds, commercial hand lettering artists, among others. Mike Gold has worked as a commercial lettering designer for over 30 years, mostly in the social expressions business. 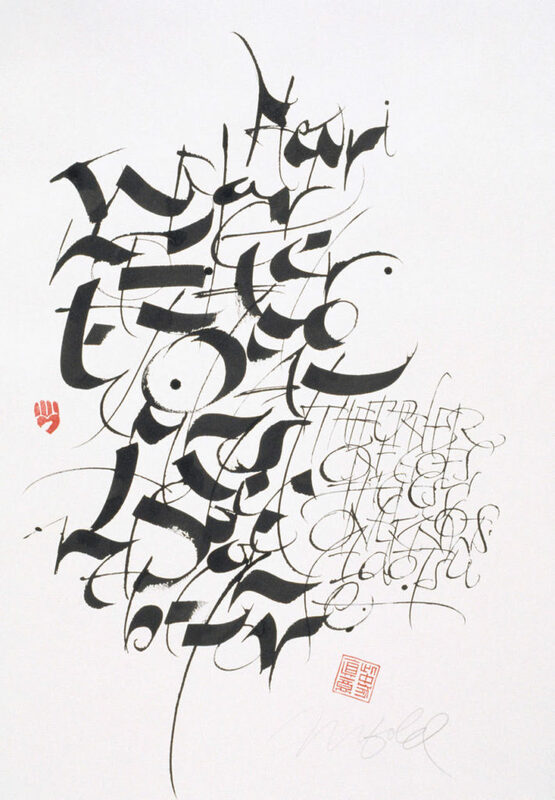 But his real passion is exploring the corridors of calligraphy that have been less traveled, the path where words and letters are design elements with which to play with line, shape and form, where creating a visual statement is more important than writing a readable text. In both his professional and personal art, Mike breaks traditional rules to create contemporary, non-traditional work. Collaboration has been a feature of some of his personal work. He especially cherishes the work and teaching he did with Judy Melvin and his 25-year involvement with Scribes 8, a collaborative group based in New Mexico. Over the last 15 years or so Mike has worked mostly on his own, developing a practice that builds on the traditions of the past, influenced by art and artists of all kinds. Being a calligrapher in the 21st century, Mike has matured at a time when calligraphers are moving calligraphy in new directions, creating new traditions, just as all artists have done over time. He still make beautiful letters and write out texts, but also explores the abstract, the illegible and the conceptual. Teaching calligraphy to inmates at a women’s prison is his most unusual teaching experience. His most unusual commission comes from Italian fashion designer Roberto Cavalli, who reproduced one of Mike’s designs on a line of clothing. Mike has an M.A. in Visual Communications and has studied with many outstanding lettering and design masters over the years. Mike has taught around the country and at several international calligraphy conferences. His personal work has been featured in Letter Arts Review many times over the past 25-plus years. All content belongs to its respective owners. Contact for permissions.